Rigid plastic license plate frame is white with blue lettering. At top it says, "I Love Ping Pong". 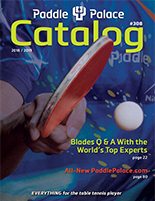 At bottom it says, "PaddlePalace.com". This is the Universal Style license plate frame. License plates from all states should fit this model frame.